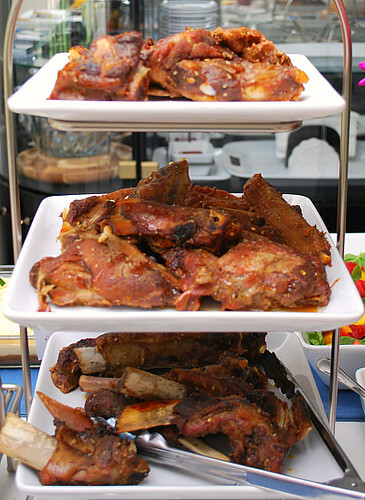 Ribs are a must during the summer and for our recent party, I wanted to serve up something different from the usual BBQ slathered variety. These Chile, Peach & Lime Ribs were outstanding. From the name alone, you'd think these would be pretty spicy but much to the surprise of my guests, these ribs were more along the sweet side. The flavors of this recipe is a combination of red pepper or chile flakes, peach preserves and the juice and zest of a lime. I added a few spices such as cumin, garlic powder and onion powder for additional flavor. Also, there's no need for salt - instead, soy sauce is used which is salty enough and gives some depth of flavor. Making these ribs was super simple and pretty effortless. Combine a handful of common ingredients (most of which may already be in your pantry) and toss in the pork to marinate overnight. When you're ready, bake in the oven or throw on the grill to cook. This could easily be made in advance to marinate, then frozen too. Don't have country ribs? No worries - use the marinade on pork chops, spare ribs, whatever pork cut you'd like... and it's also just as good with chicken! Combine all the ingredients except the pork ribs. Pour the marinade in a gallon sized freezer bag and add the pork. Seal the bag and allow the pork to marinate overnight. Preheat your oven to 325 degrees. Line a sheet pan with foil and place the marinated ribs on the pan, discard the leftover marinade. 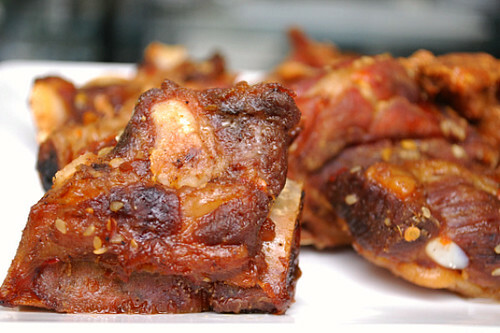 Cover the ribs with foil and bake in the preheated oven for 2 hours. Those look just delicious. I wonder what they would taste like grilled.